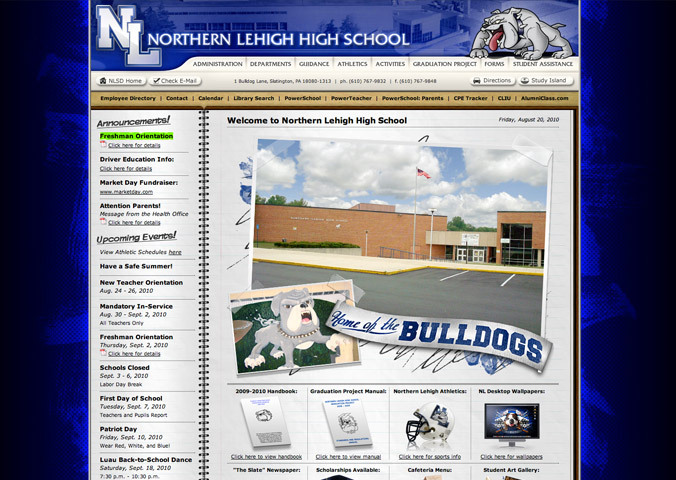 The Northern Lehigh High School website was revamped in summer 2008 to match the existing Middle School site design. The new site offers improved navigation via a consistent header and footer, all controlled via PHP coding, and includes additional features such as Google Map integration, Contact forms, and downloadable PDF documents and handbooks. Kernie Cam Productions' main focus was on providing an easy-to-use interface for students, parents, faculty, and community members to obtain important information and stay up-to-date on school-related events, athletics, and activities.